Please see our mission statement on "sign-up" page and join the fight for our children. 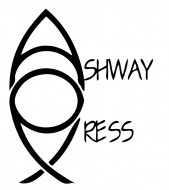 Ashway's first devotional book--Bible Bits repeatedly sold out at Briarwood Christian Bookstore and Monogram's Plus in Vestavia, Alabama. Our 2nd devotional book, Holiday Bible Bits, followed suit and became a favorite Christmas gift. If you don't have your copy, you're missing out on a real treat as Author Donna M. Evans couples real-life family stories with powerful scripture to encourage her readers that our God wants us to bring to Him the broken pieces of our lives; wayward child, illness, financial woes, special needs children, trials and disappointments--God wants them all before His throne. Bible Bits is the compass you've been searching for in a lost and fallen world. It's the perfect read for those trying to navigate our troubling times. Bible Bits speaks in a universal language and folks have purchased dozens of these books at a time for that unique, affordable gift that touches ones' heart. Our latest children's release, "Nothing's Too Hard For Me" is now released to sell. We were asked to write a book to empower and encourage critically ill children to get well. The anointing on this very special book is apparent from beginning to end. If you know a sick child who needs cheering up, get your copy today off of our site. Get yours now. 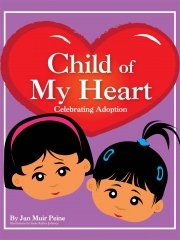 "Child of My Heart" celebrates adoption by stressing the fact that we are ALL adopted into the family of God by our connection with our big brother, Jesus. It is a delightful book of joyous union and heavenly connections. These sell at Children's Internation Adoption Clinic, and Briarwood Bookstore. Have you ever tried to explain heaven to your little ones? It's hard, isn't it? "How Far is Heaven?" has been a solid hit for parents to explain heaven to their small children when the family encounters a loss. Heaven is delightfully depicted in vivid pictures, and child-friendly concepts.Young readers will be reassured about the peace and beauty of heaven, and the security and well-being of their departed loved one. This is truly a one of a kind book for any child's library. Are you tired of this year's exhaustive list of must-have electronic gadgets for your kids? Do you want to reclaim the innocence and purity of our children from a media driven world? Then you may be interested in our other release, "Giving Me Away" which is a delightfully illustrated book on the lost concept of selflessness in a greedy and materialistic world. "Giving Me Away" is one mama's mission to change the world one heart at a time! Give these books to the children you love, and we'll personalize them for no extra charge. 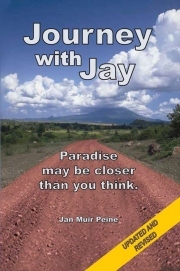 For adults striving to grow in their faith, check out our newly updated and revised, "Journey with Jay". It is a true story of miraculous healing and a testament to God's faithfulness to His children. It is a great "guy gift" for that special man in your life. 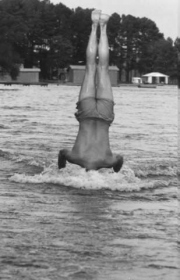 It can also be downloaded as an Ebook on Amazon. Read it and you'll never take another second for granted! I'm blessed with an editor and an artist for daughters. Please join our moms in the fight for our children.